Chamomile tea is one of the most recognizable teas on the planet. It’s renowned for its calming nature and beloved as a bedtime tea. Chamomile was used in Medieval times and by the Ancient Greeks and Romans as a cure for digestive diseases and sleeping disorders. Today, it’s a staple ingredient in natural cold remedies and used to induce feelings of calm. Chamomile tea is easy to brew and its subtle flavor pairs exceptionally with other spices and herbs. 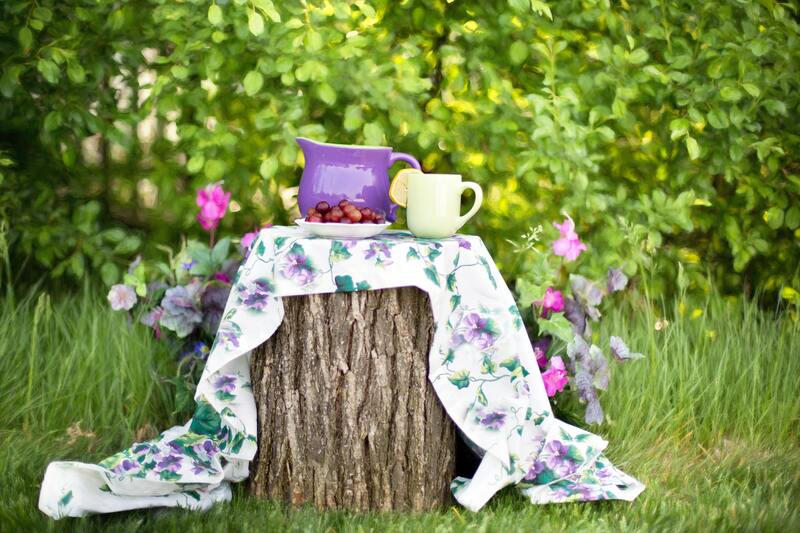 Homemade teas brewed using fresh flowers offer superior flavor. Chamomile is easy to grow in any home garden so nothing stands in the way of making this beverage from scratch. 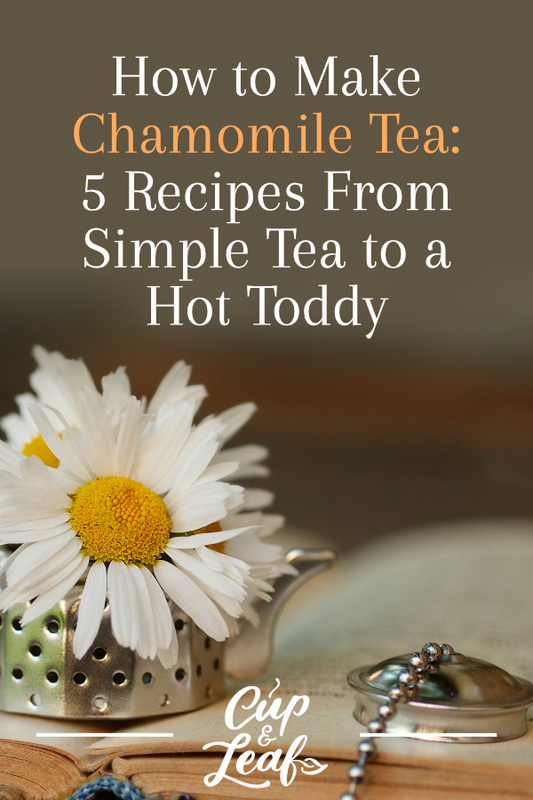 Read on to find out more about chamomile and check out our five different recipes using fresh chamomile flowers. Chamomile tea is an herbal tea or tisane. It does not contain any leaves of the true tea plant known as Camellia sinensis. Chamomile tea is brewed using just the flower heads of the plant. 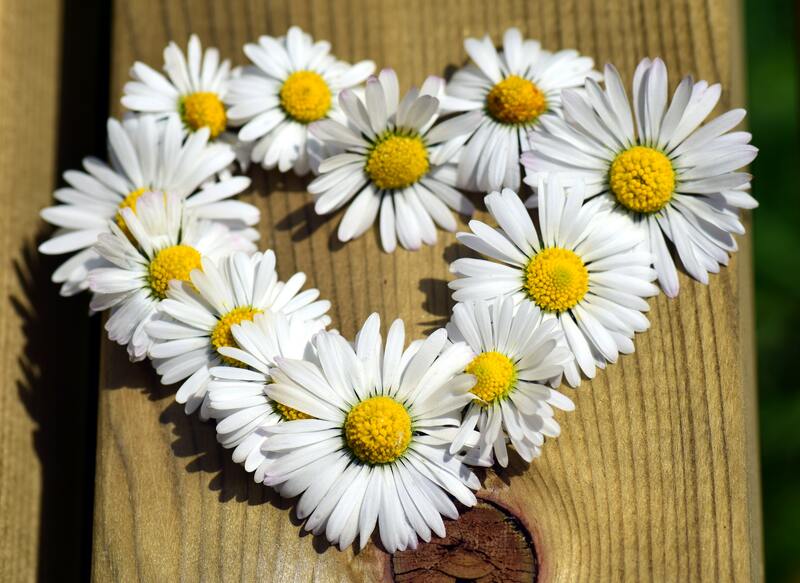 Chamomile plants have strongly scented foliage and chamomile blossoms that feature white petals and yellow centers. 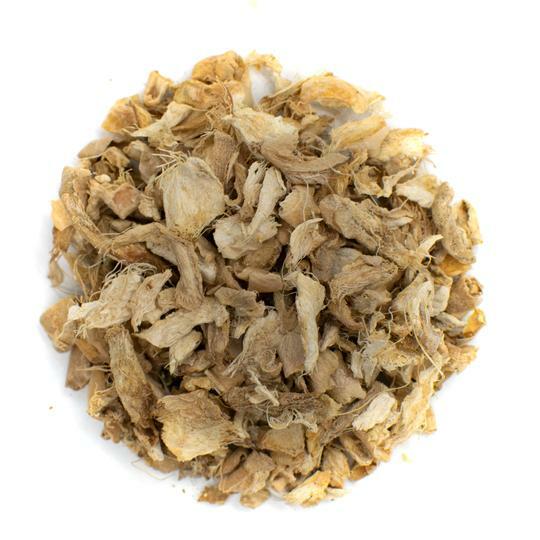 Two types of chamomile are used for brewing tea including German Chamomile and Roman Chamomile. Both types of chamomile plant are hardy and grown across the world. The plants are native to Europe and Asia, but are commonly found in North and South America. You can grow chamomile at home in your herb garden without a lot of fuss. The flowers pair well with many fresh herbs and can be used to sweeten spice or herb teas. Chamomile flowers are also available at local farmer's markets and health food stores. 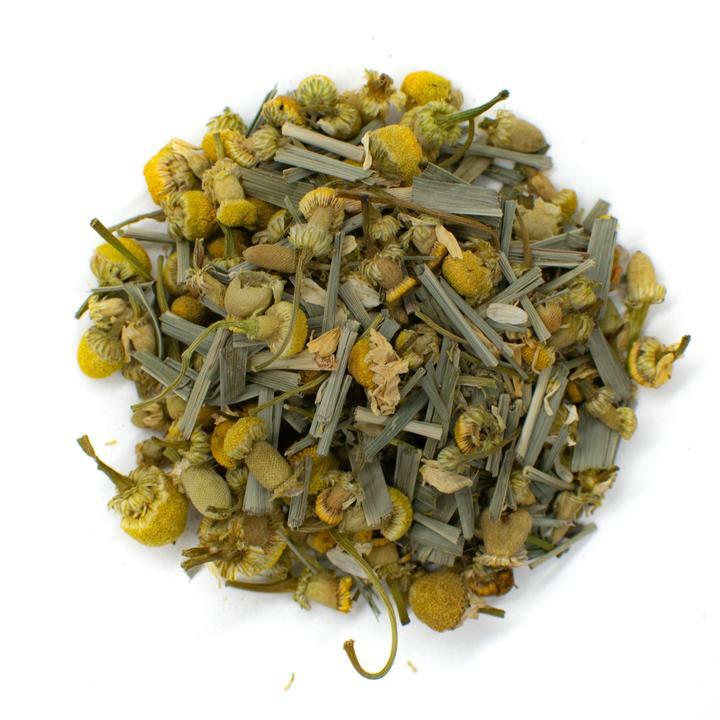 Chamomile tea is a sweet herbal infusion that has notes of crisp apple. The body of the tea is light and airy. Chamomile tea is sunshiny yellow in color and emits a fresh, slightly sweet aroma. Chamomile tea made with fresh chamomile flowers has fewer bitter undertones than those made with dry chamomile flowers or chamomile tea bags. Chamomile tea is naturally caffeine-free and thus a great choice for people with caffeine sensitivity. Our chamomile and lemongrass tea has hints of honey, lemon, and orange to help you unwind after a long day. Chamomile tea is acclaimed for its relaxing properties. It is warm and soothing in nature. 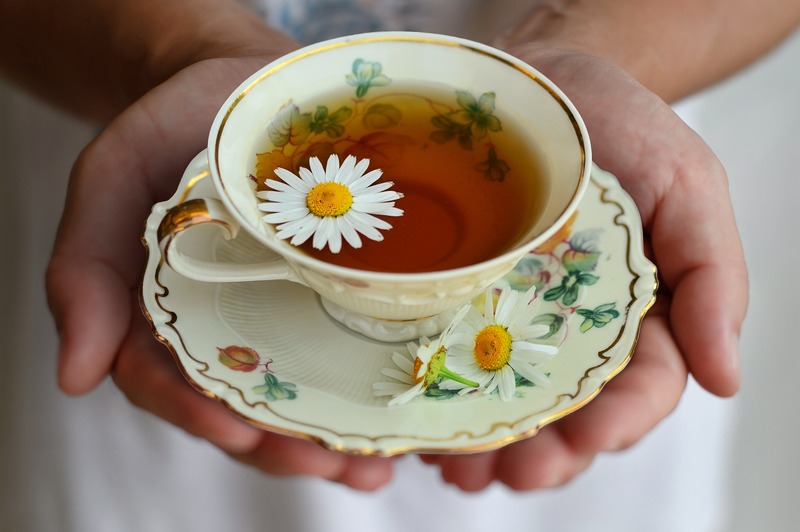 Chamomile tea triggers the release of hormones such as serotonin and melatonin, which are known to combat stress. 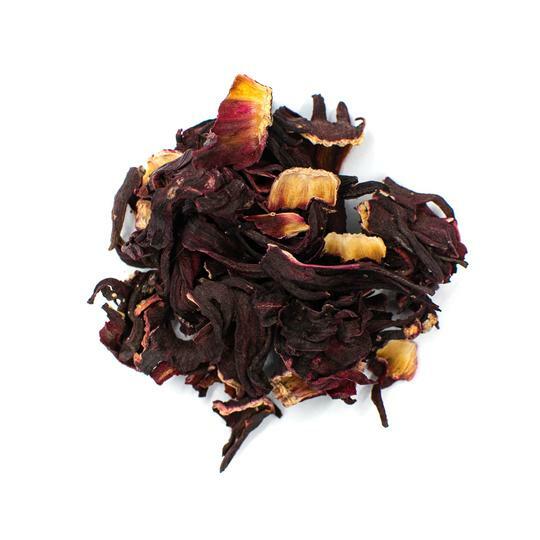 This tea also boasts anti-inflammatory properties, meaning it can help reduce tension headaches and migraines. Chamomile tea can also help you get to sleep faster and sleep more restfully. Chamomile tea’s soothing properties reduce the occurrence of upset stomach and digestive problems. The tea relieves excess gas and reduces inflammation to reduce feelings of bloat and stomach pain. Chemical compounds in chamomile also work to reduce ulcers by controlling acid levels in the stomach. There's a reason people reach for a cup of tea whenever they start feeling sick. The immune-boosting benefits of tea have been well documented in traditional and modern medicine. The fresh scent of chamomile tea can help clear up congestion. The warming properties of chamomile soothe a sore throat while antibacterial properties eliminate the cause of the common cold or flu. 1. Harvest the fresh flowers by removing the entire flower head from the stem. 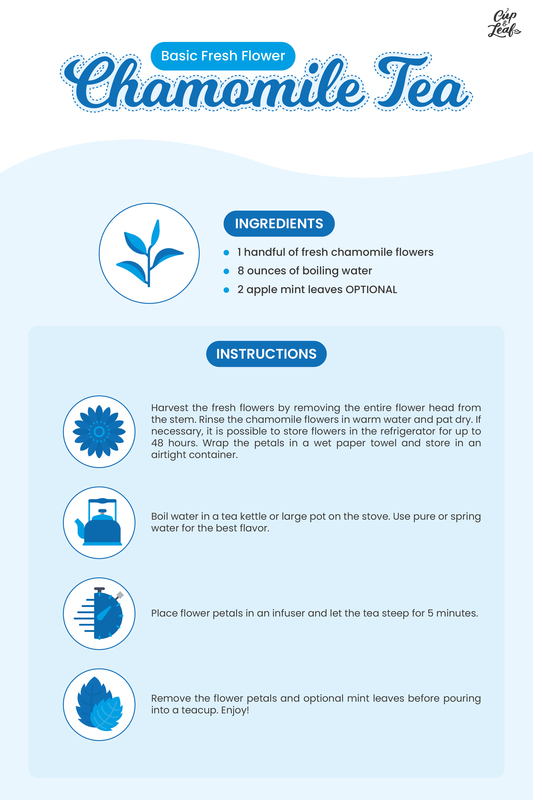 Rinse the chamomile flowers in warm water and pat dry. Chamomile tea is best made using freshly harvested flowers. If necessary, it is possible to store flowers in the refrigerator for up to 48 hours. Wrap the petals in a wet paper towel and store in an airtight container. 2. Boil water in a tea kettle or large pot on the stove. Infusion tea kettles are the best option for fresh flower teas since they have built-in devices to keep the petals separated. Alternatively, you can use another infusion device such as a tea ball or cheesecloth as a makeshift tea bag. Always use pure or spring water and not hot tap water when brewing tea to preserve flavors. 3. Place flower petals in an infuser and let the tea steep in the kettle or pot for 5 minutes. 4. Remove the flower petals and optional mint leaves before pouring into a teacup. Enjoy! 1. Use a kettle or large pot to boil water. Remove from heat and cool for 1 minute. 2. Add the chamomile flowers, lavender flowers, and mint leaves to a tea ball and infuse in the hot water. Steep for 5 minutes. 3. Remove the tea ball or use a fine mesh sieve to strain loose flowers and leaves. 4. Add lemon juice and honey to hot tea. Serve immediately. 1. Heat water in a medium saucepan until it comes to a rapid boil. 2. Remove from heat and add in chamomile flowers. Steep for 5 minutes. 3. Add maple syrup and cinnamon. 4. Heat and froth the milk. The easiest way to do this is to use a milk frother on an espresso machine or a hand frother. If you don’t have one, heat the milk in a separate saucepan and whisk vigorously. Keep whisking until small bubbles form and the milk becomes foamy. 5. Combine the water infusion and milk into a cup. Add a dollop of the milk foam to the top of the mug. Sprinkle with cinnamon and enjoy! 1. Use a medium saucepan to bring water to a rapid boil. Remove from heat and cool for 1 minute. 2. Add ginger, chamomile flowers, honey, and lemons. Steep for 1 hour or until pan returns to room temperature. 3. Strain the tea into a large glass pitcher using a fine mesh strainer. Refrigerate for 3 hours. 4. Serve in tall glasses filled with ice cubes. Garnish with a lemon slice and fresh chamomile flower if desired. Swarm up in winter months with a hot chamomile beverage. This recipe calls for alcohol so make sure to only serve to adults or swap out the alcohol with cider for a kid-friendly option. 1. Add the liquor, lemon juice, and honey to a mug. Mix well. 2. Heat the water in a small saucepan until boiling. Turn off heat and add in chamomile flowers. Steep for 5 minutes. 3. Strain the chamomile flowers using a fine mesh strainer and pour the hot infusion into the mug with honey and alcohol. 4. Garnish with a slice of lemon or cinnamon stick and enjoy! There's nothing quite as delicious and satisfying as homemade chamomile tea. You'll brew up the perfect batch every time with these great tips and recipes. Chamomile tea is easy to brew, making it a good option whether you're an expert tea drinker or a novice. Brew up a hot version to warm up and unwind or relax with a refreshing glass of iced chamomile tea.